The Problem with Survey Research makes a case against survey research as a primary source of reliable information. 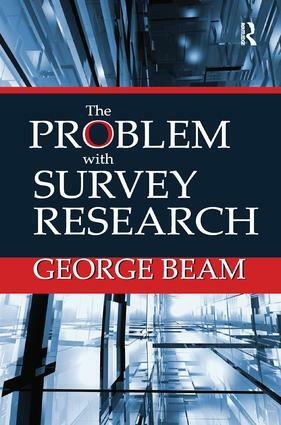 George Beam argues that all survey research instruments, all types of asking-including polls, face-to-face interviews, and focus groups-produce unreliable and potentially inaccurate results. Because those who rely on survey research only see answers to questions, it is impossible for them, or anyone else, to evaluate the results. They cannot know if the answers correspond to respondents' actual behaviors (objective phenomena) or to their true beliefs and opinions (subjective phenomena). Reliable information can only be acquired by observation, experimentation, multiple sources of data, formal model building and testing, document analysis, and comparison. In fifteen chapters divided into six parts-Ubiquity of Survey Research, The Problem, Asking Instruments, Asking Settings, Askers, and Proper Methods and Research Designs-The Problem with Survey Research demonstrates how asking instruments, settings in which asking and answering take place, and survey researchers themselves skew results and thereby make answers unreliable. The last two chapters and appendices examine observation, other methods of data collection and research designs that may produce accurate or correct information, and shows how reliance on survey research can be overcome, and must be.